Energy is what we need always. We run our homes, industries, cars and almost everything on energy. Energy can be in the form of electricity or fossil fuel. World is facing energy crisis.Pakistanis also suffering from energy crisis for many years. What we need here is to slowly switch from conventional fossil fuel and water dam energy sources to some unconventional energy sources. We again face problems when we are told by companies that electricity making machines are heavy and costly. I have few ideas to extract energy from our routine life activities. I will make my point clear with the help of diagrams and distinguishable headings. We can use climbing stairs activity to generate energy. We daily climb hundreds of stairs and spend energy just to reach at some higher room in the building. Using this activity we can extract energy in the form of electricity. 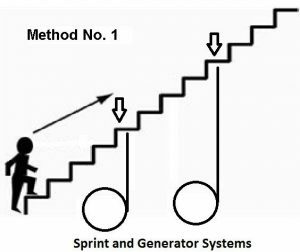 We can attach each step of stairs (made little flexible) with a separate wheel system containing spring for storing elastic energy and then running a generator. Then energy can be stored in batteries (not shown in diagram) or we can attach all stairs with one large generator. We drive cars and burn fuel part of which is used for traveling and part is dissipated in atmosphere without any use. Now we can make special speed breakers which are press able. When car will drive over it, it will press it and a system of wheels, springs and generator will run. Many of us use gyms for building our muscles or for general fitness. This is very healthy activity. 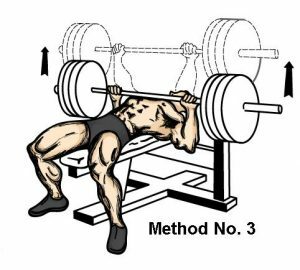 I am also a body builder so during exercise this idea came in my mind that instead of just lifting weight up (against gravity) just for building muscles, we can use it to generate energy. Instead of lifting weight up we can attach generators with our gym machines. A bodybuilder will also get necessary resistance for building muscles and generators will make energy. Scientific studies tell us that atmospheric pressure doesn’t remain constant over time. It changes during the periods of months or even days. Amazing results are found about daily variation of atmospheric pressure. Standard atmospheric pressure is 101.325kPa at sea level but its value changes somewhat over few hours of time. Change can be 5millibars in a day. 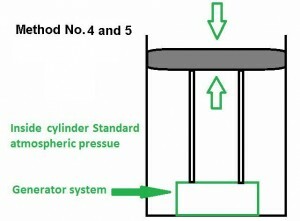 Now consider a system of tank and piston having pressure inside equal to standard atmospheric pressure. Now when the pressure of air outside will increase it will push the piston down and when the pressure in surroundings will decrease it will make piston more outward. Making use of this movement of piston we can run generators and make electricity. 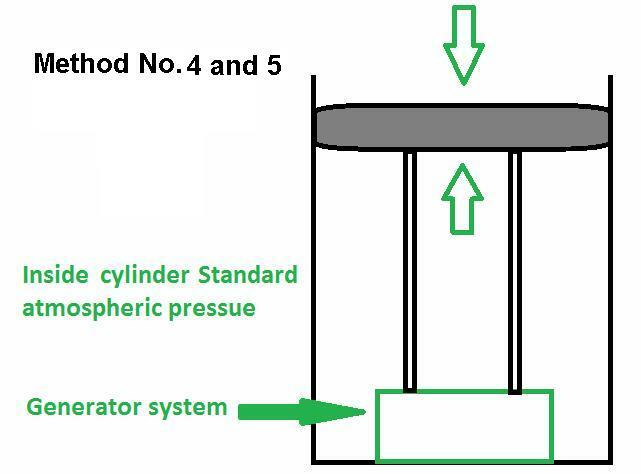 My calculations have shown the if we will make a piston-cylinder system having radius 2 meters, then when the atmospheric pressure outside will change it will exert force equal to placing 500kg object on the piston! Larger and modified systems will be more efficient and will generate more energy. Same piston cylinder system can work by change in atmospheric pressure caused by variation of temperature over day and night. It works according to the principle that gas expands with increase in the temperature and contacts as temperature come down. 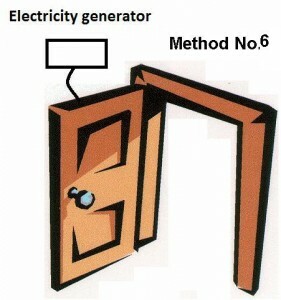 Using the doors of homes we can also run generators and make electricity. We open and close doors daily many times hence why not using this mechanical energy to make electricity. Although free and cost efficient, solar energy in contrast to all these methods is available to those areas where enough sunlight is present for considerable time. We have those areas where climate remains cloudy and solar panels cannot work continuously. Then fusion and fission reactions are highly complex and can only be implemented on country level. This is now clear that from daily routine we can extract lots of energy to run our home or industries. Now it is matter of personal and group interest in all these methods and make them work. I personally am working on these methods but an individual can make small level projects and extract energy for small use. We can make larger implementation of these projects to facilitate our country’s need of electricity. It is also important to mention that I have all mathematical calculations about these methods which can be provided at the time of making prototypes of these machines. International Civil Aviation Organization, Manual of the ICAO Standard Atmosphere, Doc 7488-CD, Third Edition, 1993, ISBN 92-9194-004-6. Good Ideas for Generation of Energy which can be utlilzed by daily low energy consuming devices. Or we can also attach all the above given methods ( of a town or housing blocks) through a system and store the energies in a central place ( battery or some other method). and utilize it in someother place .